This is adorable and I love the photos. Sometimes I get in the mood to do origami or find something artistic but dummy proof to do with my hands and I think this is a great idea. I just love how this turned out! So pretty! I love the colors too. I’d put these around the house. These are so cute! I bet they are so time consuming to do! I don’t know if I have the patience to try it! These are so beautiful and look very fun to make though I know I would mess up a couple of times before getting it. Really, really cool! Like Jessica though, I don’t know if I’d have the patience. It would end up looking like an origami ball of paper. wow! you are so artistic! i love the colors and they are so cute! Oh my god this is so cute! Looks so hard to make when you look at the result! loving the colors! i love origami! i have started to do origami but i am very far from such a result! 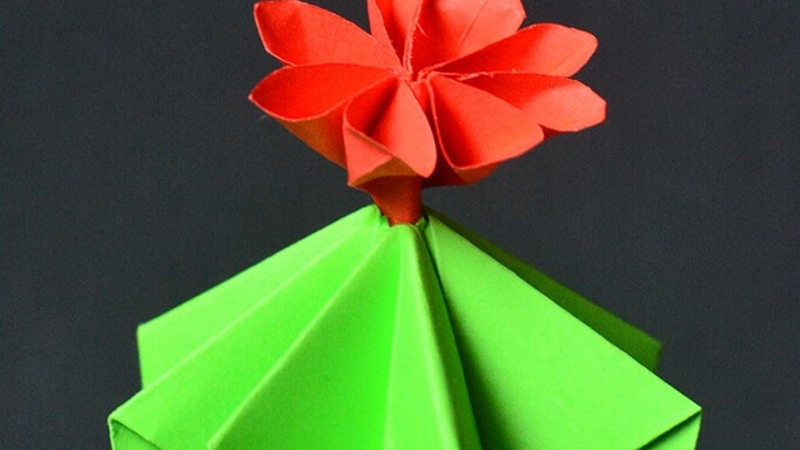 Such an beautifully made paper cactus. Will try to make it. I love this!! thanks for sharing, will try it this weekend! This is seriously so cool! Love this cool origami project. Oh my goodness how cute are these as an origami idea, it amazes me with all the things you can make out of paper. Love the end result. It’s so pretty! Now I want to try this with the boys. origami’ started. Thanks for sharing. I wish I had seen this last year when I was teaching origami at my library. It would have been such a neat craft to do there. Instead I was doing other things. This is amazing and would make a awesome gift! A group of them, with papers of different sizes would look great for home decoration.